This "Root Beer Habanero" is described by Dave as having a "Nice clean heat, a touch of sweetness with hints of Root Beer and a long lingering finish". Beef, brown sugar, contain 2% or less of the following: salt, black pepper, garlic, onion, crushed red pepper, root beer extract, cayenne, jalapeno pepper, habanero pepper, ginger, dried maple syrup, celery powder, lactic acid culture. The first flavor to hit the palate is a significant sweet, with overtones of maple. There's a bit of heat building up. The chewing brings on more sweetness, along with some light chile pepper flavor, and perhaps just a wee bit more maple, and a lightly noticeable root beer. For being marketed as "Root Beer Habanero", particularly as having a "nice clean heat" and "hints of Root Beer", it seems to hold up well. I definitely get a fair amount of heat, especially an amount that I would expect from a jerky identified as "Habanero". But I also get the hints of root beer too, not a lot mind you, but hints. If anything, it's quite sweet, which is what I would have expected from a "root beer" flavored jerky. 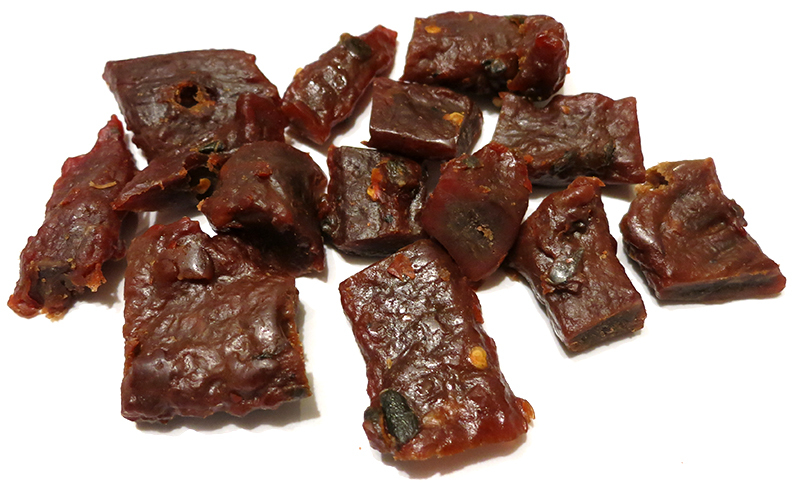 Otherwise, the flavors that define this jerky is largely the strong sweetness, with a touch of maple, and fair amount of chile pepper heat. There's a lighter amount of chile pepper flavor, though it doesn't have the pungent, fruity character of habanero. There's also a lighter garlic/onion seasoning. The level of heat in this significant. I'd rate it on my personal heat scale as "medium hot" (level 4 out of 5). The meat consistency is significantly different than that found in the company's "Classic" and "Jamaican Jerk Jerk" varieties. This meat is more thick, more tender, more juicy, and more enjoyable to chew. It's almost like kippered beef chunks. It chews more like meat, and not as crumbly as Dave's other varieties. 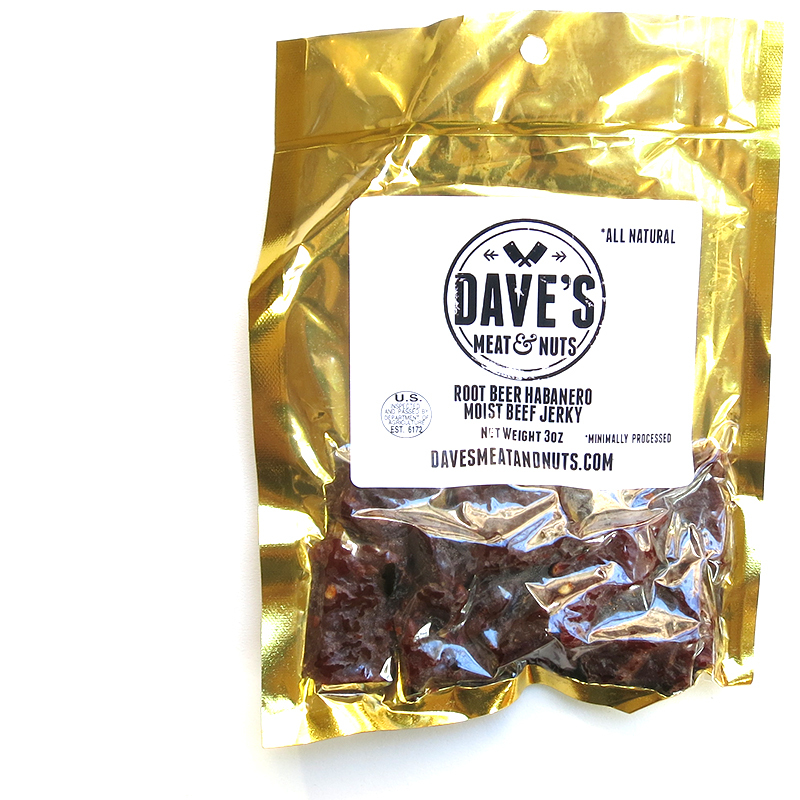 This "Root Beer Habanero" jerky from Dave's Meat & Nuts seems to deliver well on the idea of a jerky infused with habanero heat and hints of root beer flavor. I do get plenty of heat, though not necessarily the flavor of habaneros, which I really hoped to get. 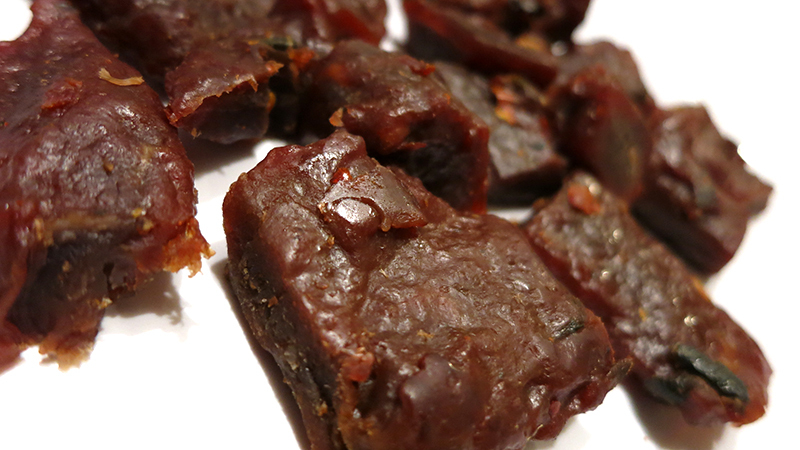 The hints of root beer, along with the heavy sweetness and maple syrup, only seem to make this jerky more decadent. Meanwhile, the thick, moist chunks of meat plays right into the hands of a meat-snacking connoisseur.